This week, there is another chance to make winning POR’s of 40% and above with the best-selling biscuits from Pladis. 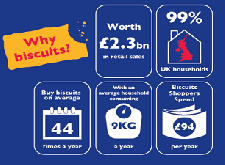 You need to check out the figures they have provided to up your sales, with the top 3 sellers in London being McVitie’s Milk Chocolate Digestives, Oreo Cookies and McVitie’s Digestives, of which both are on offer this week. For more advice on increasing your POR’s and giving your customers the best choices possible, you can visit Pladis’ B2B site, betterbiscuits.com. In this week’s supplier week, Heineken’s customers are encouraged to invite their friends to #sharethedrama of the UEFA Champions League. There is major hype behind this epic final with the fun & creative ads that Heineken produced. These ads feature 3 football stars - Ronaldinho, Ruud Van Nistelrooy and Jerzy Dudek who are ducking lasers and dodging bullets, rather than playing their usual role on the field. Therefore, it’s a good idea to stock up on Heineken to keep your customers prepared for a weekend of DRAMA! 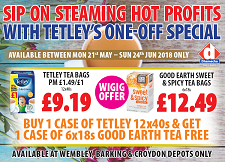 There is a one-off special this month with Tetley’s was PM £1.49, now PM £1 price-marked tea bags of £1.49 and Good Earth (if your customers prefer the caffeine-free alternative). The offer is valid between 21st May and 24th June 2018 only, so take advantage and sip on some steaming hot profits. It’s a great ‘when it’s gone, it’s gone’ offer, where you can buy a case of Tetley 12x40s & get a case of 6x18s Good Earth Tea FREE. So get your hands on these popular teas now, as they are only on offer in our Wembley, Barking & Croydon depots.